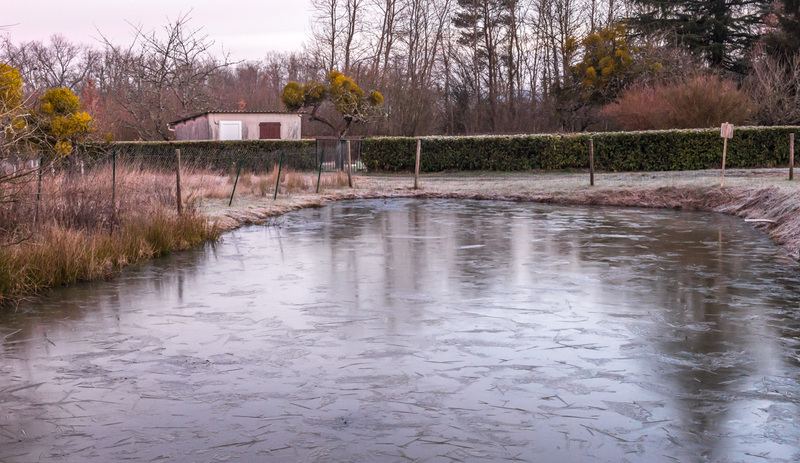 We've been down to freezing for the past couple of mornings and the little pond outside our back gate has frozen over. The ice is very thin, not at all safe to stand on. In fact, I'm sure if a duck landed on the pond it would break the wafer-thin layer of ice. Still, it's kind of pretty. 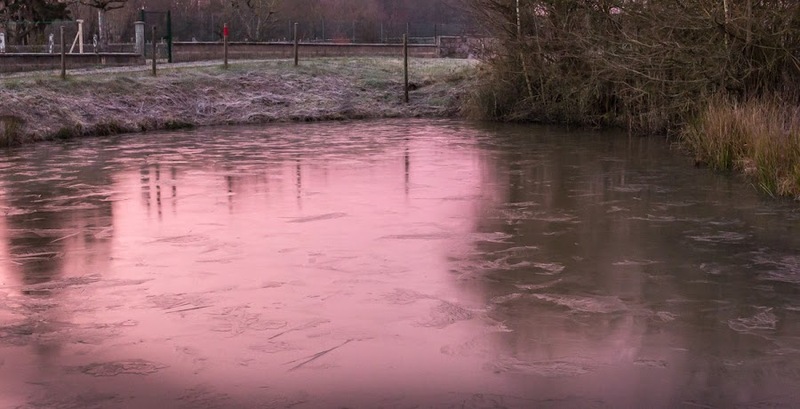 In the first shot, which looks kind of toward the south, the pink sky of sunrise is reflected in the ice. In the second shot, I'm looking back toward our yard, kind of toward the north, and the more usual gray sky is reflected. The ice thawed as morning went on. Those yellow-green balls in the apple trees are mistletoe. It has taken over. It hasn't been a typical cold winter this year. So far. It's cold enough to have a daily fire in the wood stove, but hard freezes have been few to nil. We're still getting ladybugs and other flying insects coming into the house every day. I think they get in through the weep holes in the window frames or make their way upstairs through the cat's open window in the garage. It's not cold enough outside to kill them. Hard to believe now, but it used to be cold enough here for puddles to freeze. Weep holes in the window frames? What are they? Odd to think of flying insects still coming into the house. We have had them at times, too. At least they are ladybugs and not some awful other thing. Our winter hasn't been as cold nor windy as it could be. But there's still time. The colors on the pond are beautiful. I think the first is iPhone Champagne. The mistletoe makes those trees look misleadingly lush and healthy. I've seen ladybugs come out in the first warm days and trundle around and around window frames in the light. I assumed they lived somehow in the window frames of old houses. How nice to have a pond or any moving water near your house. andrew, they're little holes that allow moisture from condensation to escape. judy, it's unusual this year. melinda, we find them in the spaces between the jamb and the window itself, huddled, waiting. sillygirl, we have stinkbugs, too. Awful other things. mitch, the mistletoe is pretty, but it's killing the trees. emm, I see ducks in the pond often, and a heron a time or two. There are frogs and little fish as well.